Characteristics of Christian Movements That Move Forward, Last And Have A Global Impact. I recently entered into a conversation with a pastor (3-5-15) concerning the characteristic of Christian movements that move forward, last and have a global impact. The basis of the conversation was an article written by Alan Hirsch, “The Logic Of My Writings.” In it, Alan Hirsch explains the connection that exists between nine of his books. This article was used as a starting point in a conversation about lasting, influential and global Christian movements. The following are some “take away” points of the conversation. These are not Alan Hirsch’s reflections, nor any one person’s reflection. They are what I walked away with from a conversation with a pastor. I thought I should get them down while these thoughts are still fresh in my mind. Discipleship – helping people to grow in Christ likeness and followers of Jesus. Communitas – Growing in community through sharing in mission and sufferings. Organic Systems – Networks grown out of relationships. It is God led and driven. Apostolic environment – Breaking new ground with new vision for the future. Incarnational mission – Revealing the Gospel, by becoming like the people. All of his is supported by frameworks and foundations. – frameworks support the movement of the church but they will change as the work of God unfolds in different generations and different environments. Jesus is the center. What does Jesus being the center mean? I used to confuse Jesus being the center with the Bible being the center. But this is not true. Jesus is a living being. He died and rose again. He lives and reigns forever more. He dwells in believers through the Holy Spirit. We must have a relationship with the living one, Jesus Christ and not confuse this with enjoying epiphanies of truth through Bible study only. Bible study may aid us in getting to know Jesus in more detail, but knowing Jesus is simply knowing our Savior and Lord, Jesus Christ. Jesus being the center is important, because we can easily make a Christian mission or the latest Christian project the center, or even the Bible, the center. Discipleship. This involves mentoring others. First of all, one can not mentor others unless they are a disciple of Jesus themselves. The goal of discipleship is to know Jesus, and become more like him, experience his grace, love and truth, and follow him, maturing in our Gospel faith. Communitas. This has to do with community and the bonding that occurs between members of that community. It is not just hanging out together socially. It is not just studying together and eating together. It comes when you share a mission together. It occurs when the mission involves some sacrifice, suffering and commitment. It is a mission bathed in uncertainty. When this happens then communitas are formed. Imagine a football team or an orchestra or a platoon fighting together in war, or a team of missionaries going into new territory to preach the gospel where Jesus is not yet known. There are communitas formed among the members. There is a bond that is not easy broken nor forgotten. This is the ultimate sense of community. This type of Koininia propels and supports the growth and spread of the church. Organic Systems – When I think about organic I think about a living organism. Living organisms grow. All of their parts are interdependent on each other. They respond to the challenges and changes of the environment they are in. The same can be said of an organically growing church. The church movement contains networks that are connected to and grown out of relationships. It is God led and God driven. It is ever expanding. An organic system realizes that all the parts are interdependent on one another. These organic parts are not just isolated within one church body, but include the entire body of Christ. (and possibly partnerships outside of the church.) Organic systems are part of lasting, influential and global church movements. Apostolic environment – Some people think that the term apostolic has to do with the first century church. Or it has to with a historical connection needed for people to be leaders in the church. But apostle literally means, “One who is sent.” Being apostolic involves breaking new ground with new vision for the future. It involves visionaries and missionaries who are able to take Christ and the gospel to new areas where the Gospel is not known. It involves grappling with the popular culture to see it transformed by the Gospel in permanent ways. 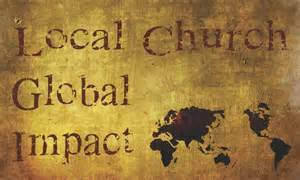 Long lasting, influential and global Christian movements operate in an apostolic environment. Incarnational mission – This involves revealing Jesus and his Gospel, by becoming like the people. Jesus was the epitome of incarnational. John 1:14 reads, “ And the Word became flesh and dwelt among us, and we have seen his glory, glory as of the only Son from the Father, full of grace and truth.” (ESV) Jesus is the King of the Universe. He enjoyed all the glory, power and majesty of the Kingdom of Heaven and gave it all up in order to take on flesh, being born as a tiny, poor, baby in a manger. He became like us so that he could identify with us and become our faithful High Priest forever. Jesus suffered like us, lived among us. He died at human hands. But he rose again from the dead and leads all who believe in him to the Kingdom of Heaven to be with him forever. This is the definition of being incarnational. Influential church movements are incarnational. Members of the movement seek to be incarnational, becoming like the people they are called to serve. It is more than just living among different people groups. It is all about becoming like that people group. It means letting go of the trappings of our own culture and adopting that of the people we serve. For example Jesus could have dwelt among sinners, appearing as he does in John’s vision in the Book of Revelation. He could have been a glowing person dressed in pure white with blazing eyes. He could have walked among the people like that. He could have slept and ate with them, cooking food with his blazing eyes. He could serve day after day like that. Is that incarnational? No. Jesus took on flesh and became human. He was like a root out of dry ground. That is incarnational. Christian movements that last and have a global influence, and the people therein, are incarnational. All of his is supported by frameworks and foundations. We like to operate within frameworks. Frameworks make things easier. But frameworks must never be static. They are never meant to stay the same over every culture and generation. Frameworks serve to provide the means to communicate the Gospel to a particular people group. If frameworks serve their purpose then keep them. But if they no longer serve their purpose then toss them and seek God’s wisdom to find another new construct to operate through. Foundations are important. But the foundations must be of the Christ and not of human origins. Ephesians 2:19-21 read, “So then you are no longer strangers and aliens, but you are fellow citizens with the saints and members of the household of God, 20 built on the foundation of the apostles and prophets, Christ Jesus himself being the cornerstone, 21 in whom the whole structure, being joined together, grows into a holy temple in the Lord.” (ESV) There can be no other foundation. One may try to base a Gospel work on the heritage of a missionary or a past church movement, but if that heritage is not the foundation of the universal Christian church, then it is a foundation that can not stand and it can not propel a Christian movement forward to influence the present generation. Frameworks and foundations can never be used to enslave people to them to serve the framework’s purpose. In some sense, frameworks take on their own self protecting and self perpetuating character, like an animal that does not want die. They could become like idols, where people serve to upkeep the framework more than propagating the Gospel. This must never happen either. In the culture that we live in, the church has become a body that places utmost importance on teaching. And so, every Sunday and every meeting the highlight of the meeting includes some type of teaching from the Bible. Bible teachers, expositors of the Scriptures, shepherds have taken the forefront of church movements. But is this the only way? Missional thinkers propose another way. What if a Church movement is headed up by first apostles, second prophets, third evangelists and then shepherds and Bible teachers take a supportive role behind these three? Apostles would lead the church into new areas where Christ is not known. They will propose new vision and direction for the church. Prophets will keep everything aligned with God. Evangelists will go forth preaching the Gospel among the people, strengthening networks and nurturing organic church growth. And then come the Bible teachers and the shepherds. They teach. They create environments for teaching and discipleship.